I've wanted to attend a Catalyst conference for a long time and I finally got my chance on Monday when Catalyst One Day came to Dallas (these guys are the leaders at developing leaders) . 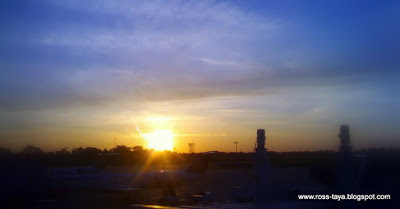 I caught a cheap & quick flight on Monday morning and returned the same night. The event was incredible. I've got pages and pages of notes and I picked up so many great concepts, quotes, and ideas, but it seems like more than anything, God used a few simple reminders to challenge and convict me. 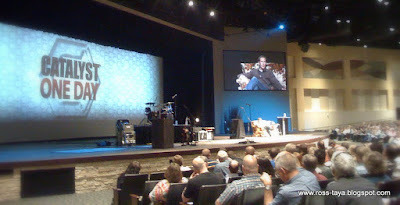 Pete Briscoe opened the conference with prayer. He asked that God would make us "traffickers of grace and messengers of the mysteries of God." What an excellent request! The main speakers, Andy Stanley & Craig Groeschel, gave excellent messages on the principals of Momentum in life and ministry. There were plenty of "aha moments", when I knew exactly how I could apply the concepts in my situation. There was a continual challenge to step out in faith. The verse that kept coming up was "without faith it is impossible to please God." ~Hebrews 11:6 I've read that verse so many times before and I feel like I know it... but I needed the reminder because I have noticed that lately I haven't been excercising my faith much. One cool thing that Catalyst does at all of their events is to "plan" for a few times of "un-scripted and unexpected" activities and messaging. For instance, right after lunch we came back to our seats and saw a frisbee on each one. 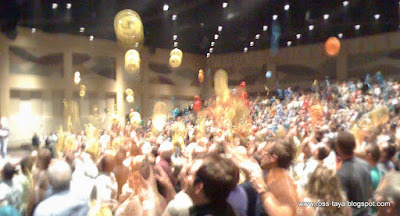 Within a few minutes the MC had us tossing frisbees all over the place and what should have been a post-lunch lull turned into a lots of laughter and boosted the energy level among the 2500+ conference guests. "It's not about doing what you have always been doing just a little bit better... it's time to do a new thing. To reach people that no one is reaching, we must do things that no one is doing and we must refuse to do the things that are not making a difference." Would you say that you are experiencing positive Momentum in your life/church/job/relationships right now? Are you trying new things, or are you just tweaking old things and hoping for different results? Do you embrace the "unplanned and unscripted" moments in your life? Could your life be defined as a "trafficer of grace" or a "messenger of the mystery"?